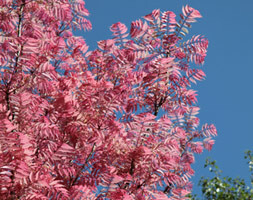 A deciduous, often multi-stemmed tree, which makes a fine specimen in a sunny garden. In spring, the big, pinnate leaves emerge a bright salmon pink and gradually change colour to creamy yellow and later rich green in summer. The clusters of greenish white, cup-shaped flowers that appear in summer seem to dangle from the ends of the branches and are loved by insects. All parts of the plant are scented and the wood is often burnt in temples in Eastern Asia to infuse them with its delicate scent. The timber is also valuable for making furniture as it is very duarble and easy to work with.